South Africa; fertile. Robert Anderson. © Robert Anderson (Robert.Anderson@uct.ac.za). Published in: Krauss, F. [Krauss, C.F.F. von] (1846). Pflanzen des Cap- und Natal-Landes, gesammelt und zusammengestellt von Dr. Ferdinand Krauss. (Schluss.). Flora 29(14): 209-215. The type species (holotype) of the genus Halimeda is Halimeda tuna (J.Ellis & Solander) J.V.Lamouroux. Adjective (Latin), wedge-shaped (Brown 1956). According to Silva et al. (1996) the name Halimeda macroloba has been misapplied to this species by Harvey(1855b: 564) and Harvey (1863: lvii, pl. CCLXVII). They recommend consulting J. Agardh (1887: 86-87, under H. versatilis) for more details. 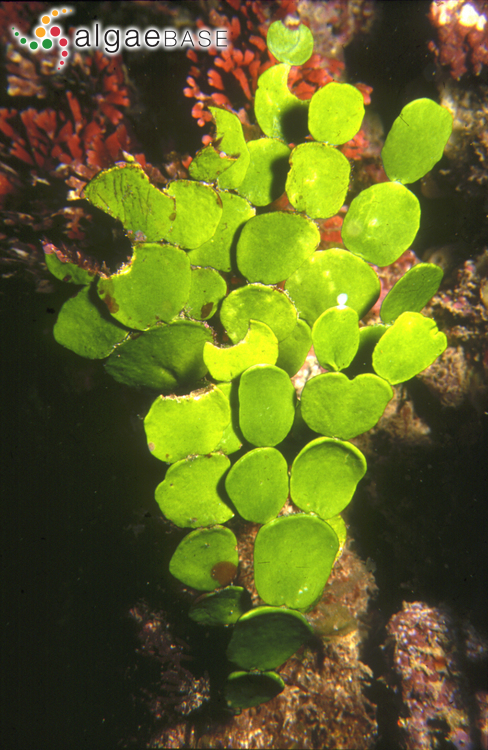 Type locality: Natal Bay, South Africa (Silva, Basson & Moe 1996: 865). Type: Krauss; BM (Womersley 1984: 246). Notes: See Hillis 1959: 346 (Womersley, 1984:246). Accesses: This record has been accessed by users 3361 times since it was created. Bandeira-Pedrosa, M.E., Barreto Pereira, S.M., Bouzon, Z.L. & Oliveira, E.C. (2004). 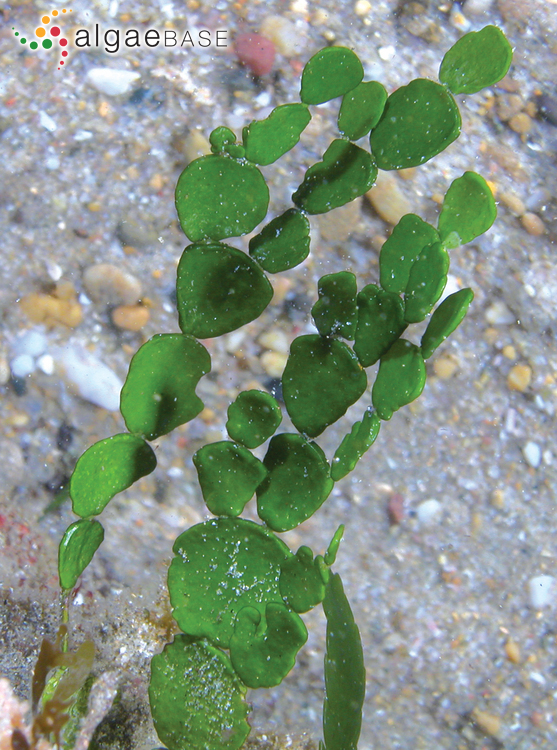 Halimeda cuneata (Bryopsidales, Chlorophyta), a new record for the Atlantic Ocean. Phycologia 43: 50-57. Chihara, M. (1956). 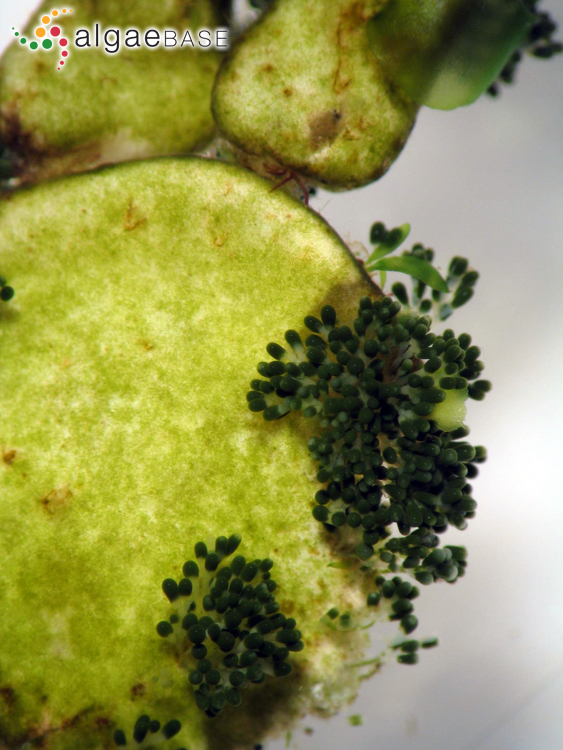 Studies on the life-history of the green algae in the warm seas around Japan (4): On the life-history of Halimeda cuneata Hering. (1). Journal of Japanese Botany 31(4): 102-110.